The 626-ST Medi Exam and Procedure Table is a very solid choice for a wide range of applications, and great for most specialties. 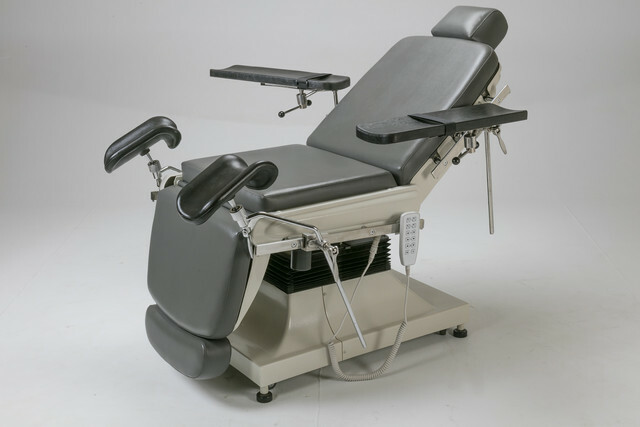 If you're looking for a surgical chair, and exam table, procedure table, spa table, med spa bed, the 626 ST Masters is a fantastic, versatile choice. This high end, feature rich medical table comes with a programmable hand-wand control, and a programmable foot-control, and three different interchangeable headrests. The foot control has pre-programmable positioning settings. This comfortable table Has recessed wheels that extend at the push of a button, allowing the table to be moved, and/or rotated, and giving the table a very functional mobility, as well as providing you with convenience too. This delux procedure chair is compatible with both ankle and/or knee stirrups. Medical treatment table is great for general purposes, including but no limited to exams, in-office procedures, injectables, liposuction, and coolsculpting. It is completely suitable for prone and supine treatment positions. This great table will handle larger patients well. It has an extremely wide height range, and will work well for doctors who are taller and also doctors who require a higher working surface. Wins in comparison to Midmark, Ritter, Hill, Brewer and many other medical exam tables at two-to-three times the price ! The 626-ST Masters Power Procedure Table is almost always in stock, come fully assembled, and are ready to ship, for delivery within 5 business days; we can also time your shipment for your delivery needs. This excellent, high-performing procedure chair has pre-programmable positioning. You can set the position that it will return to when you press the buttons that you pre-programmed to positions you use most. It will rotate, via a retracting wheel set. Few beds have wheels. Most beds, when wheels are added, become less stable. This one bed is an incredibly stable bed—and it also has wheels. They retract up into the underside of the frame of the base. When you need to use them then with the push of a button on the hand control wand, the wheels extend and lift the bed off of it's stationary feet, and the bed can be wheeled around. Then you retract the wheels again with the push 0f a button when the table is once again in place. You press a button on the hand control and the recessed wheels come down, allowing the bed to be spun or rolled. When the wheels are recessed, the bed sits on rubber feet at each of the four corners. This table comes pre-bundled with the foot operation pedal, the hand control wand, the face rests, and the side rails. You can take a look at the product details brochure now by clicking on the two photos below the main product photo. Please inquire for a link to our operational video, for you to view. This is a medical grade chair. 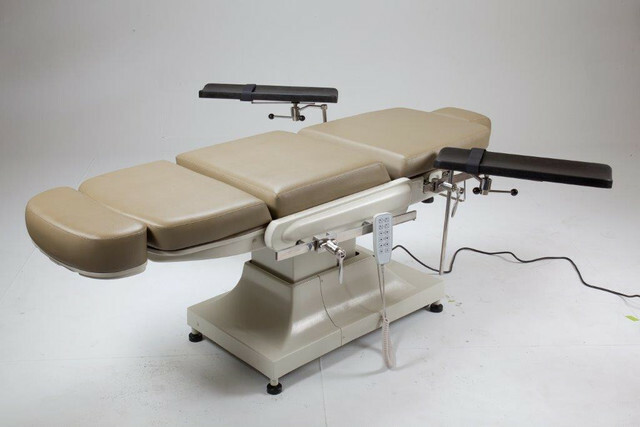 This is a 4 function medical procedure table which controls height, backrest, and footrest and seat inclination. The armrest flips back 180 degrees and the headrest is adjustable. The upholstery is high quality which makes it easy to clean. Headrest are removable and can be extended by 4"
Flat Chair Height (Minimum): 26"
Flat Chair Height (Maximum): 40"
**Stirrups & Arm Boards are sold separately. Table comes standard with a Hand Control and Foot Control.